This crash near the intersection of Ludlow Road and U.S. Route 36 injured 3 people early Friday afternoon. 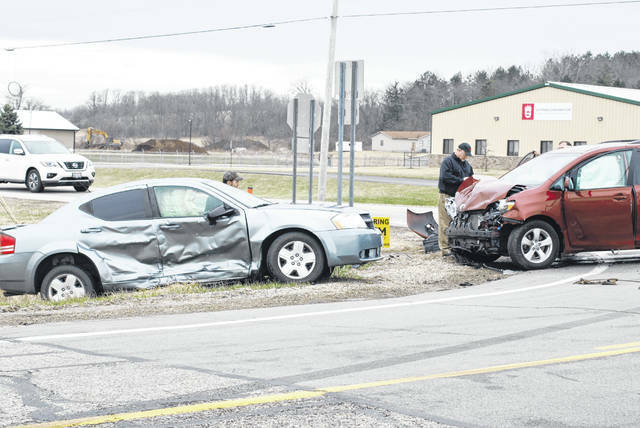 A two-vehicle crash near the intersection of U.S. Route 36 and Ludlow Road/state Route 814 at approximately 12:54 p.m. on Friday injured three people. William Gambrell, age 56 of Bellefontaine, was driving a 2009 Dodge Avenger northbound on Ludlow Road. Gambrell was a single occupant in the vehicle and was transported to Mercy Health – Urbana Hospital for evaluation and treatment, according to information from the Champaign County Sheriff’s Office. Rowland Shaffer, age 68 of Cable, was driving a 2012 Toyota minivan westbound on Route 36. Shaffer was also transported to Urbana Hospital for evaluation and treatment. His passenger, 70-year-old Rita Shaffer of Cable was also transported to Urbana Hospital for evaluation and treatment. At this time all injuries appear to be non-life threatening, according to information from the sheriff’s office. The crash remains under investigation by the Champaign County Sheriff’s Office.